Today marks the start of Polarion's Software's annual Polarion Live User Conference in Stuttgart, Germany. One keynote presentation, sure to be of interest to this year's attendees, will feature Pascal Vera, who leads Systems Engineering and Mechatronics product initiatives and strategic planning at Siemens PLM Software as well as heads the company's Teamcenter Mechatronics product management efforts. He is joined by Stefano Rizzo, SVP Strategy and Business Development who is responsible for long-term vision and product strategy at Polarion. Following last month’s announcement of Polarion’s partnership with Siemens PLM Software, today’s presentation will detail the approach, benefits and roadmap of the integration. The partnership was established in response to the highly competitive and complex environment of modern-day manufacturing, where innovation is more and more relying on the software component of embedded systems. While opening up great new opportunities, such integration of software into mechatronics also presents unprecedented challenges. For instance, previously siloed teams all of a sudden have to closely coordinate their development efforts in a dynamic ecosystem spanning the globe, and different software and hardware components have to be seamlessly fused to ensure functional safety and compliance. 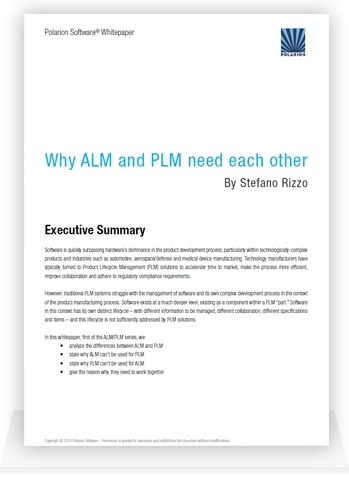 Siemens and Polarion believe that the integration of the two technologies will succeed because it is the first integration of software engineering data and processes with product development throughout the lifecycle, and based on an end-to-end integrated ALM-PLM vision that also encompasses embedded software and Model-Based Systems Engineering (MBSE) aspects. Today’s presentation will reveal specific milestones including the planned General Availability (GA) of the first phase of the integration. Stay tuned for additional info and photos posted directly from the conference venue. AdrianW on: Polarion Synchronization Connector for DOORS. Help us improve Polarion UX!